« Chickens, Goats, Honeybees, and Me? 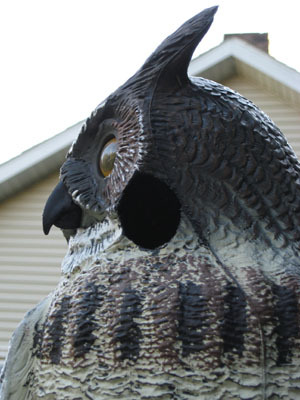 …photos of the hole drilled into the guardian owl’s face by the enterprising downy woodpecker. 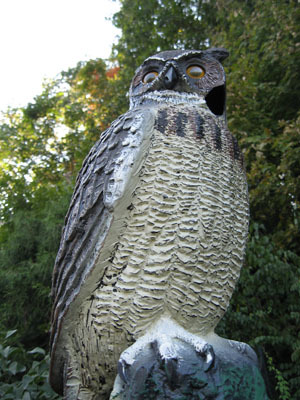 The owl's proud spirit is unbroken, despite the tiny woodpecker's obvious disdain. I have also promised you my recipe for Crispy Kale. I picked kale this morning, and after I return from a stint in the office, and my much-anticipated workshop on raising chickens/goats/honeybees, I will head to the kitchen with husband-in-tow (he’s a better photographer than I), to deliver on that earlier promise! •	Legend has it the red patch on the head of the male bird inspired legends with many Native America Tribes across the United States, from being a fire detective to bearer of a warrior’s badge or courage. This small bird has been a symbol of bravery and hard work. 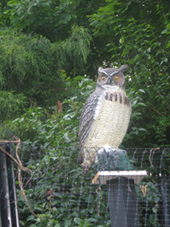 •	Special feathers around their nostrils keep them from breathing in wood chips. •	Their brain is protected from shock by a pad of spongy elastic material between their bill and their skull. •	Woodpeckers may hammer on a tree as much as 100 times a minute.